I have three FO’s to share with you this week: two knitted and one spun! 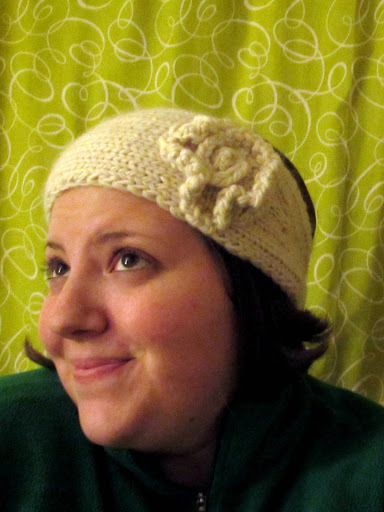 My childhood next-door-neighbor commissioned me to knit her this flowered headband/earwarmer. She sent me a photo of what she was thinking and I set about recreating it. It was a lot of fun to design something on-the-fly, without worrying too much about making sure it was repeatable or that the steps were explain/understand like I do when I am designing for my patterns. 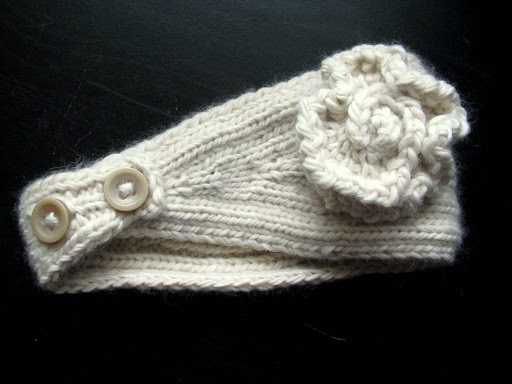 For this headband I held the yarn double so it would be extra thick and warm. I increased until it was wide enough, knit straight for a bit, and decreased back down with a few buttonholes thrown in. I knit it in a rib so it would have good stretch and loft and wouldn’t curl in on itself much. I followed this cute flower tutorial with a few changes (mostly just increasing more than it describes for a larger, rufflier flower). Darwin looks so happy to be included in this photoshoot, doesn’t he? I think it came out super cute! I hope the recipient likes it. Here is the finished secret cowl that I made for my dear Fiasco for Valentine’s Day. He had become a little bit obsessed (for a non-knitter) with this fantastic yarn when I made myself a cowl (to the point where he made visitors feel the fabric of said cowl) so it was clear he needed one of his own! I borrowed elements from my Dissipative cowl design and manly-ed it up a bit: knitted at a larger gauge, made it wider and taller, removed the lace and added a few cable details. I really love how it came out and the color is just perfect. It’s a slightly purple-ish grey with streaks of acid green. A little more adventurous than the plain dark greens I usually use for the Fiasco’s knitwear but still plenty manly. 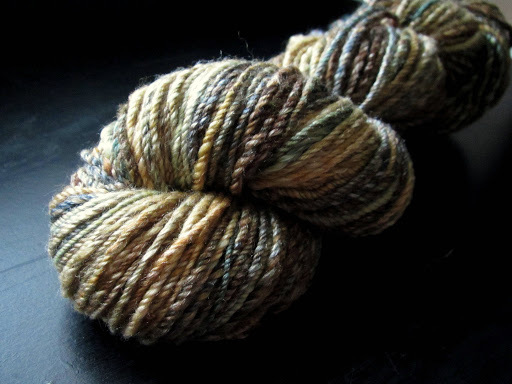 This yarn was spun from 70% superwash Merino / 30% SeaCell fiber dyed by The Wacky Windmill in the colorway “The Shire”. I ABSOLUTELY ADORE IT. 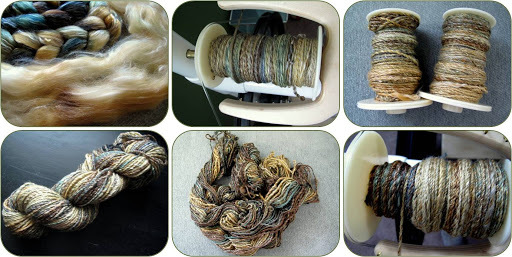 I am not really a ‘brown’ person, but this skein is so much more than brown. It’s so earthy and golden and shining and wonderful and the colors couldn’t be prettier. I split the braid in half so the finished skein would have long color repeats, spun the singles worsted-style counterclockwise from the top, then chain-plied (navajo-plied) each single into a 3-ply yarn. Most of the second bobbin was spun by candlelight when the power went out during the blizzard last weekend, so it had a few more thick spots than the first. All told I ended up with about 182 yards of approximately worsted-weight-ish yarn (I always forget to measure wraps per inch before I skein the yarn). I’m having fun wracking my brain for what this skein should become, what do you think? This entry was posted in FO, FOFri, handspun by shoelaceswitcher. Bookmark the permalink. Ok, that headband is gorgeous, if she doesn't love it there is something wrong. 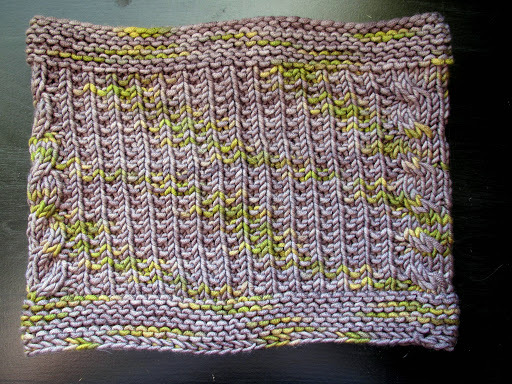 And so is the cowl, the color and stitch pattern work so well together. Finally, that yarn is amazing. I can see it as a cowl or scarf of some sort, or maybe even mitts. I love the headband and cowl in equal measure, well done and the shire yarn is gorgeous, I love the colours in it and can't wait to see what it gets used for. That headband is really cute. I love the flower. The cowl looks great too, the color is really pretty. Lovely headband! And your cat is lovely too. I love the new yarn!! 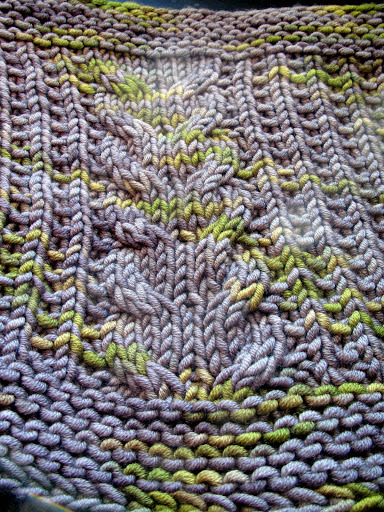 It's hard to tell the feel of the yarn from photos, but for me, I using decide projects based on that. HTH!